Lori Shafner, VP, Global Development Team Leader, Alexion Pharmaceuticals, Inc.
Tim Miller, Co-Founder, President , Chief Scientific Officer, Abeona Therapeutics Inc.
Paradigm Global Events is again proud to present our Orphan Drugs and Rare Diseases 2018 Americas East Coast. It’s the 8th in the series of our Flagship tri-annual Orphan Drugs and Rare Diseases event, this congress will provide you with a comprehensive overview of the critical issues shaping the future of Orphan Drugs in the US market. According to a recently published report, Orphan Drugs set to be 21.4% of worldwide prescription sales by 2022. The market for orphan drugs, based on the consensus forecast for the leading 500 pharmaceutical and biotechnology companies, will grow by 11.1% per year (CAGR) between 2017 and 2022 to $209bn. The growth of the orphan drug market is more than double that of the overall prescription drug market, which is set to grow by 5.3% over the period 2017-2022. Orphan drugs are set to account for 21.4% of global prescription sales in 2022, excluding generics, up from 6% in 2000. In 2016 orphan drug sales increased 12.2% to $114bn vs. 2015, while non-orphan drug sales increased by 2.4% to $578bn. (Evaluate Pharma). However, some factors such as high initial investment that leads to higher per patient treatment cost, reimbursement uncertainties and high cost of drug development are hindering the market. North America registered significant growth for the market during the forecast period due to rising healthcare spending, constructive government initiatives, growing occurrence of chronic diseases and small timeline required for orphan drug development. 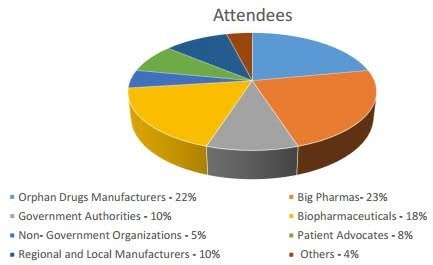 Orphan Drugs & Rare Diseases 2018 Americas will provide a unique platform for the convergence of stakeholders in the orphan drugs industry to discuss and network with top tier government, hospitals, pharmaceuticals, biopharmaceuticals, non-profit organizations, orphan drugs developers as well as regional and local manufacturers. We are putting together an agenda that address the driving macroeconomic factors, policies and issues that will steer the development of orphan drugs globally including commercialization, policies, reimbursement, pricing and more. We look forward to welcoming you at the congress! Policies to Support Patients with Rare Diseases?